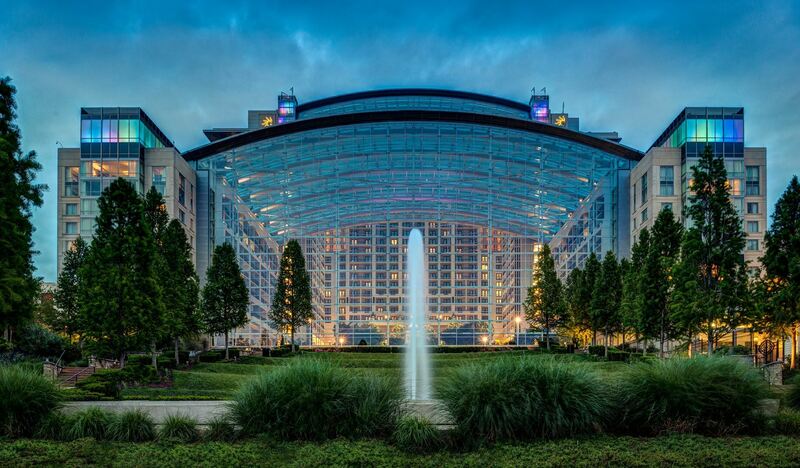 Immerse yourself in an unrivaled stay at Gaylord National Resort, the crown jewel of National Harbor and Washington DC's newest waterfront dining and entertainment district. Located on the Potomac River, just steps from the shopping and entertainment that National Harbor is known for, this watefront resort provides you with the best of both worlds. Whether you're enjoying a ride on the Capital Wheel, visiting MGM National Harbor with the city's complimentary circulator bus, or exploring the 19 story glass atrium, you'll discover an extraordinary adventure. Local attractions include The Capital Wheel, MGM National Harbor, Washington DC, Old Town Alexandria, and Smithsonian Museums. AAPL has negotiated a complimentary resort fee for our attendees and it is included in the room rate. The resort fee includes: transportation to locations throughout National Harbor via the Circulator Bus, daily credit for dry cleaning in the amount of $10, high-speed internet access, daily newspaper available at Key Provisions, two bottles of Aquafina water per room per day, fitness center and pool access, and a coupon book with valued savings of over $100. Self-parking is offered at a discount of $22.50 per day for AAPL Conference attendees. (The usual rate is $30 per day.) Valet parking is available at $43 per day. $234 single/double plus 18% tax (includes Resort Fee for AAPL attendees). Cut-off date for AAPL conference rate is Tuesday, May 22, 2018. Special rate extended 3 days prior/post conference dates based on availability. Gaylord National offers an exclusive Daily Shuttle Schedule 6:00 am - 8:00 pm express to and from Reagan National Airport. Gaylord's preferred shuttle service to all local airports. the number one choice for the most efficient and cost-effective airport service to all Washington metro area airports. SuperShuttle's friendly, responsive, and reliable drivers and staff work hard to make every ride a positive experience for their passengers. To make your shuttle reservation, call 1-800-660-8000, visit www.supershuttle.com, or stop by the Transportation Desk located in the front lobby. Express Eco-friendly sedans & ExecuCar private black cars offer non-stop, private transportation to and from all airports, train stations, and downtown locations. Our service is currently available 24 hours a day, 7 days a week. Please contact the transportation desk at 301-965-2081 or email nhtsgaylord@execucar.com to book your car today. discount code GNR50 on prepaid reservations only. If you prefer to UBER, click on the link below to get your "sample fare" istimate from any of the airports to the Gaylord Hotel. Please note that the estimated fares do not reflect variations due to traffic delays or other factors. Flat rates and minimum fares may apply.